Hermeneutics is the philosophy of meaning and understanding. It was transformed by phenomenology, first through Martin Heidegger (1889 – 1976) and then by Hans-Georg Gadamer (1900 – 2002). I have to admit I did start reading Heidegger’s Being and Time but I didn’t get too far, it being one of the most difficult philosophical works to comprehend. My strategy instead was to begin to work my way through Truth and Method, deepening my own comprehension of phenomenology via hermeneutics. Along with Heidegger and perhaps Wittgenstein, Gadamer is often thought to be one of the most profound and important philosophers of the twentieth century. I wanted to explore his work as I am so interested in the concept of meaning and how I can come to deepen my own way of asking questions of reality. 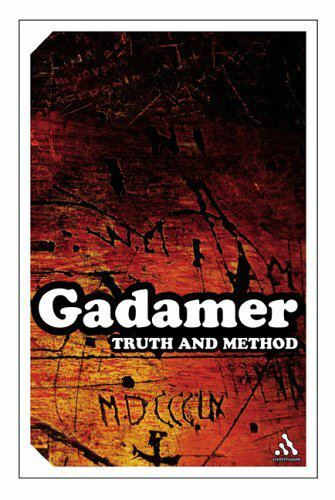 My own teacher Henri Bortoft told our class that Gadamer was probably the most knowledgeable authority on Plato, and reading Truth and Method it soon becomes clear the extent of his genius. I have only got as far as completing the first chapter, but I thought I would begin to blog as an exercise in documenting what my far more limited and non-classically trained intellect and mind can glean. I know I have missed a huge amount of what has been written, but I do feel that it is a worthwhile endeavour nonetheless. My plan is to have one blog per chapter, and then perhaps as I delve deeper into the book, these first writings will gain a deeper meaning for myself as I come back to them! Chapter one is titled Transcending the Aesthetic Dimension and so I thought I should at least illustrate this article with one of the most aesthetic pictures I know of (to me anyway). 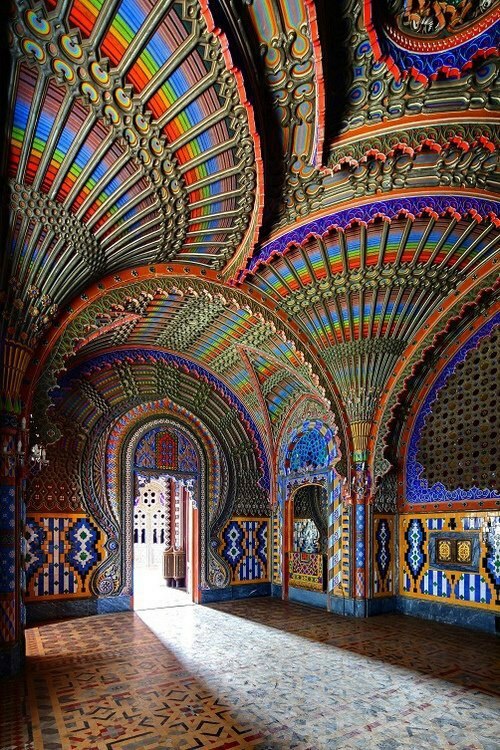 It is the Peacock Room Castello di Sammezzano in Reggello, Tuscany, Italy, but unfortunately I do not know the photographer to credit. Weimar Classicism (German “Weimarer Klassik”) is a cultural and literary movement of Europe. Followers attempted to establish a new humanism by synthesizing Romantic, classical and Enlightenment ideas. The movement, from 1772 until 1805, involved Johann Wolfgang Goethe, Johann Gottfried Herder, Friedrich Schiller and Christoph Martin Wieland, and often concentrated on Goethe and Schiller during the period 1788–1805. I think though for me we se the notion of what is now only recently coming to light in modern neuropsychology in works such as those of Iain McGilchrist, and this is the way in which logical, rational and abstract reasoning disconnects us from the natural world. The discussion on taste begins in part one but continues through to the second part, whereby Gadamer explores Kant’s Critique of Judgement to a level of analysis that again was lost on me. What was not lost on me though in this discussion was the way in which the way in which mankind has conceived of the notions of taste, judgement, aesthetics, beauty, morality, genius, symbols and allegory have changed many times over the last few centuries. This is a fascinating discussion to those of you who like me are interested in mental models, and also the relationship between our mental models and our conception of science. We can not simply review the scientific achievements of the past using the same concepts and mental models of today. In order to truly understand the science of an era we have to work hard, almost impossibly so, to understand the true meanings of the world views and the shifting notions of these concepts. What became clear to me was the profound discussions in German classicism based around the difference or otherwise of the comprehension of beauty in nature compared to the comprehension of beauty in art. Here we find a wonderful quote from Hegel who suggests that both natural and human objects can express moral ideas in artistic presentation. I think one of the most frustrating parts for me was reading the sections on aesthetic consciousness. I was conscious of the fact that I was reading intellectually, and I absolutely know that I have not fully grasped this notion by experiencing it. It is that terrible half-way situation where you understand what you don’t understand. I would love to know which teacher could guide me into the experiencing of aesthetic experience, since I am sure that herein may lie the key to unlocking what follows in the book. And so it is that we end up where we started, which is at the end of Chapter One. I assume what will follow is an exploration of how it can be that we do reach an understanding of the meaning in a work of art. I do not know if this has been rambling for you. But I have said this before, I often blog purely for myself in an effort to understand the level of understanding I have reached, and it has been very useful to go back through this chapter and see what stood out for me. I feel I have not done it justice, and although I may not have understood the concepts such as Erlebniskunst experientially, it was quite amazing to see the breath and depth of ever changing thought which often remain hidden or as an obscured backdrop to the ever dominant natural sciences with their focus on discoveries and achievements. I know it is not just me who struggles. One reviewer of Heidegger’s The Question Concerning Technology, and Other Essays on Amazon said that it took him five times the meaning of the concept of Enframing so it is not just me. The translator Donald Marshall says in his introduction that while noting the challenges especially for the American reader, Truth and Method is “powerful and exciting.” Absolutely it is and although I may not be grasping the concepts which translation into English makes even harder to comprehend, you are gaining a crystal clear and diamond sharp insight into one of the greatest philosophical minds of the last century. I have a feeling of what I want to say the relevance will be to me in later articles about Gadamer, and this relates to our relationships in a technological world and the search for meaning of what it means to be human. Alan Moore runs an amazing series of workshops he calls Transformation Laboratories. In this he facilitates the development from a linear world into the non-linear, but it is not technology just for the sake of new technology. Maybe this is a cultural trend, but rather than just blindly search for meaning, first we must learn what meaning is, how it can be comprehended, and for this we can look to Gadamer. Would Goethe’s method of observation, as explained by Bortoft, be labelled an ‘aesthetic’ way of knowing? To see things for ourselves, to contemplate them deeply and mindfully and feel the gesture in things – by direct sensing for ourselves? This is a method Im working on for observing medical images (and others) seen in one’s day to day encounter. I really enjoy your blog. It’s very helpful for when these texts seem impenetrable. I would say Goethe’s method of observation would definitely fit the notion of Bildung, of course. However, I am not too sure about the notion of what is meant by “aesthetic”, especially as it seems to shift over time. There does seem to be this notion of shifting away from just your own point of view in order to be able to see the more universal, and this could well be the same shift in seeing that Goethe was using to sense the One and the many in plants. I am hoping that someone who really does know about aesthetics in German philosophy can answer this question of yours, since I have only just become aware of this dimension to consciousness through my reading of Gadamer. I am glad you are enjoying my blog though. Some times I do feel that there are some things I can speak well about, and at other times I am writing just as much for myself as anyone else to help in my own cultivation of Bildung. As Henri always said, it is a lifetime endeavour. It intrigues me that you chose to represent the most aesthetic picture you know with the image of a work of architecture. As you know when the four dimensional qualities of architecture are represented in a picture, it has less perceptive value than the content of an echo. If I go on an ‘experiencing architecture’ tangent this note will grow into an essay. We’ll leave that for another time, suffice to say that architecture is a wildly complex sensual/intellectual experience, less so for a tourist. As I read your synopsis of Gadamer’s first chapter I was reminded of a notion I am developing that phenomenologists, struggling with their perceptions, would benefit from taking a walk in an architect’s shoes, just as architects would benefit from becoming more aware of their conception/perception continuum. Your blog and reference to Bortoft has helped me understand my conception/perception continuum much better. Compared to writing, architects have the wonderfully challenging domain for conception – ‘a bringing into being’ – a four dimensional form/space that through its process of becoming through the processes of design and construction to enable perception, occupancy and utilization offers the settings, the space for ‘dwelling’. There is a Melburian, Leon van Schaik at RMIT, a professor of innovation, of all things, who is aware of this challenge and has developed an invitational Phd for mid-career architects to enhance the command of their creativity. His book, The Pink Book, is a description and case study record of his work. I think you would enjoy it. Thanks for blogging your reading experience. When I finish Taking Appearance Seriously I will send you some of my impressions. It looks like I can’t make an attachment, for the graphics, in the reply box so I will set up a wordpress blog and you can see them there. This will take a couple of weeks. Many thanks for your comment. The architecture photo is no accident since Bortoft writes about architecture as well. I would be very interested to read your thoughts about Taking Appearance Seriously when you finish his book. It seems to be helping many people a lot. Thanks for your recommendation. On my “to read” list is Ingrid Stefanovic’s new book The Natural City: Re-envisioning the Built Environment.